The Funky Felter: Odds and Ends on this Friday - A Contest, Business Tips, and New Discoveries Too! Odds and Ends on this Friday - A Contest, Business Tips, and New Discoveries Too! It seems like some weeks I can not think of a thing to blog about, and then other weeks, I have more things than I can find the time to post about. This is one of the latter weeks so I decided to do an odds and ends post this Friday with a bunch of interesting things that I came across this week. Below you'll find a random listing of things that I found to be worth looking at for whatever reason. I hope that you enjoy my ramblings and that you have a fabulous weekend! I was contacted by Linda, the editor at Craft Gossip's Felting Blog, about a contest that they are sponsoring. It is for a Grandma's Snowmen Needle Felting Kit by The Felted Ewe, and it is cute as cute can be! Go visit the post about it for more details and to enter the contest, and maybe you'll be the lucky winner. Once again Timothy Adam Designs has come up with some wonderful business tips! This time it is all about increasing views to your Etsy shop items. It is well written and well worth your time for a good read. I highly recommend that you visit the Timothy Adam Designs Blog article on "3 fixes for the low views on Etsy" - it is spot on and so very helpful! While reading through the Fiber Friday post in the Etsy forum, I came across this link from the seller crostinivs. It is about a fiber artist named Emily Barletta who makes magnificent felt and crochet sculptural pieces. It is certainly worth a look to get inspired by her creations! 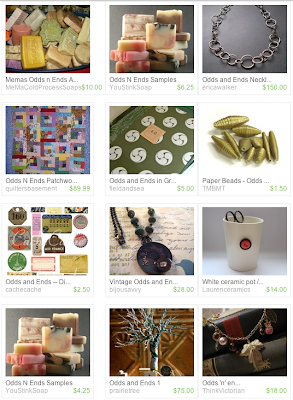 on Etsy for "odds and ends" which came up with the lovely array of items you can see at the top of my post. You should try searching Etsy for phrases and peculiar words to see what you get. I find it rather fascinating and sometimes surprising to see the random items that look so very pretty all together. Finally . . . have a Happy Halloween!! I hope that you and your little trick or treaters are safe and sound and enjoy the evening. Very cool! I read Timothy's tips yesterday - truly worth it!